A 21-pound lobster caught off Cape Cod has found a new home at the New England Aquarium in Boston. That's after a raffle for the lobster at Capt'n Elmer's Fish Market in Orleans (or-LEENZ'), the town where it was caught July 14. 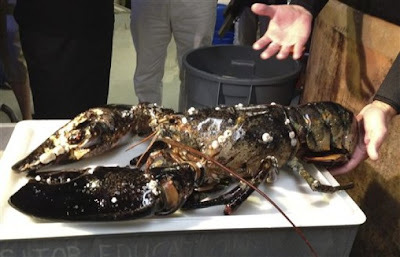 The winner was to receive some smaller lobsters and a chance to be there when the big guy was released into the wild. But the winner wanted the big lobster donated to the aquarium instead. Aquarium spokesman Tony LaCasse says the lobster arrived Monday and will be displayed after a routine 30-day quarantine period. It'll be rotated into the exhibit, provided it doesn't tear up too much of it or eat hard-to-replace fish sharing the space. Big as it is, it's smaller than the 35-pound Lobzilla that lived at the aquarium in the 1980s.